North America Trailer Company Ltd. manufactures highly specialized trailers for a variety of applications. We have over 40 years of experience in the trailer industry and have built some of the most innovative products ever built. We are the only manufacturer in our class to feature an engineered structure designed specifically to match the demands of large slide-out configurations. Our competitors modify existing trailers to meet their needs; we build ours from the ground up with the trailer's intended use in mind. Our slide-outs are the largest and strongest in the industry. Our advanced proprietary slide-out system ensures maximum strength, reduces body twist and sags and allows for slide-outs of maximum size. Our slide-outs actually interact with the structural envelope of the trailer to increase the strength of the slide-out and main body while providing an extensible footprint to support even the largest slide-outs. 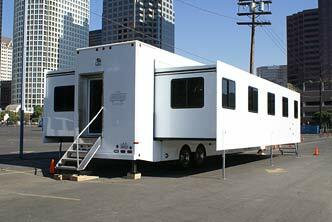 North America Trailer Company Ltd. can construct any configuration that best suits your needs. We offer lengths of up to 53 feet and expanded widths up to 24 feet. We can incorporate any number of slide-outs in multiple widths and depths. We also offer a two storey design that incorporates an elevating top which gives you a complete second floor. North America Trailer Company Ltd. is your only choice when it comes to specialized trailers. Our unparalleled structural integrity and standout features combined with our impeccably appointed interiors will ensure you years of proven reliability and beauty. It's no wonder why North America Trailer Company is the world leader for innovative mobile solutions.